Osteoarthritis is a degenerative disease in which the cartilage cushioning the joints becomes damaged and worn. With Rheumatoid Arthritis, an autoimmune malfunction causes the immune system to attack the joints themselves. In both cases, the body responds with pain and inflammation. Doctors have long sought to treat pain by addressing inflammation. 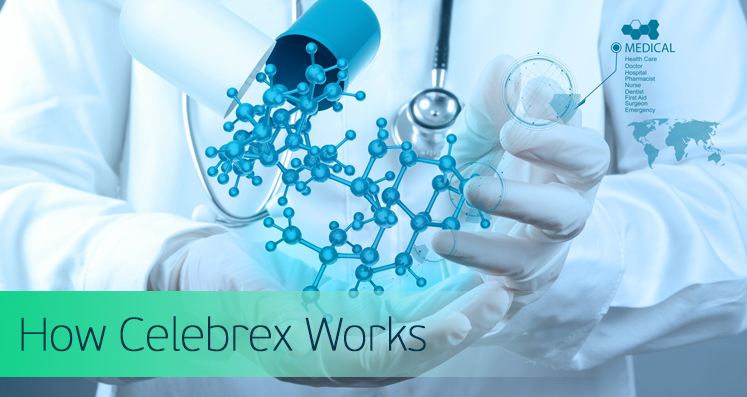 Celebrex is a type of COX-2 Inhibitor, a class of drugs commonly prescribed to treat the symptoms of chronic pain conditions such as arthritis. COX-2 Inhibitors like Celebrex target pain by prohibiting the absorption of the enzyme cyclooxygenase. COX-2 Inhibitors were intended to be an improvement on traditional NSAIDs, which equally target COX-1 and COX-2 enzymes, thereby causing a much higher incidence of gastrointestinal damage. Many pain medications work by affecting the interaction of two enzymes found in blood vessels, the stomach, and the kidneys. These enzymes, COX-1 and COX-2, are responsible for the body’s production of a chemical called prostaglandin. Prostaglandin has multiple functions in the body, some of which are harmful, and some of which are protective. So-called “good prostaglandin,” formed by the COX-1 enzyme, functions to protect the stomach lining and gastrointestinal tract by preventing stomach acid from penetrating tissues. COX-2, on the other hand, is responsible for the production of so-called “bad prostaglandin,” which causes a chemical reaction resulting in inflammation and pain. COX-2 inhibitors were created with the goal of targeting COX-2 enzymes specifically, while sparing the COX-1 enzymes that protect the gastrointestinal tract from injury. Traditional pain killers such as ibuprofen target COX-1 and COX-2 enzymes almost equally, resulting in their association with stomach pain and ulcers as a side effect of pain relief. Specialized drugs like Celebrex specifically target the COX-2 enzyme with 7 to 300 times more preference than the COX-1 enzyme, theoretically providing a much greater proportion of pain relief compared to the possible gastrointestinal damage. The “super-aspirins” Celebrex, Vioxx, and Bextra offer a potent form of COX-2 inhibitor which, although it does not directly damage the gastrointestinal lining as in the case of aspirin, still causes side effects similar to those of traditional pain killers.